There are few things that Star Wars fans actually want to talk about when it comes to the prequels, but it is pretty universally accepted that Ewan McGregor as Obi-Wan Kenobi is a bright spot. Now that Disney and Lucasfilm are working on some spinoff movies in the Star Wars universe, the subject of an Obi-Wan Kenobi standalone during the years between Star Wars: Revenge of the Sith and Star Wars: A New Hope has come up quite often. And it seems like if Ewan McGregor had his way, it would be two movies. The actor recently did an interview with the French publication Premiere and the folks over at Den of Geek were kind enough to translate some of the quotes. During the course of the interview, Ewan McGregor talked about the possibility of returning to play JediObi-Wan Kenobi again, which has been fairly common lately. Here is what he had to say about it. "I've always thought there was a story to tell between my last one and Alec Guinness' first one. It would be fun to film that story now I'm older. I'd be the right age. I'm forty-five, Alec Guinness was what, sixty? I could do two of them (laughs)! I hope that they're going to explore different genres under the Star Wars banner. And one of those could be an Obi-Wan Kenobi feature film. Or two! The Obi-Wan Kenobi Story Part 1 and Part 2!" Ewan McGregor has talked quite a bit in recent months about his willingness and desire to do another Star Wars movie centered around Old Ben. Even with his casual, jokey tone in these quotes, it does seem like something he has thought about quite a bit. Also, given that he openly is saying he wants to do two movies means he is pretty committed to the idea should it come to pass and isn't just entertaining the idea of doing one more movie for a paycheck. 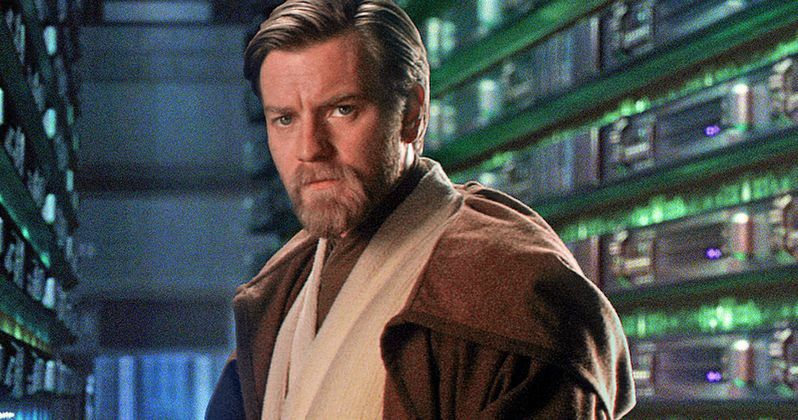 About a year ago, we reported on a rumor that suggested Disney and Lucasfilm were looking at doing an entire trilogy of new Star Wars movies centered on Obi-Wan Kenobi and the years he spent on Tatooine. A few months later, a report claimed that Ewan McGregor was in talks for an "unknown" project with the studio. Neither of those reports was ever confirmed and the actor insists that nobody has approached him. However, Disney is planning on making a lot of Star Wars movies and it isn't at all hard to imagine that, given his willingness, they would tap Ewan McGregor to reprise his role in a new movie (or two) as Obi-Wan Kenobi at some point. Ewan McGregor already lent his voice for Star Wars: The Force Awakens to do a new Obi-Wan line during Rey's Force dream, so the relationship is clearly there between him and Lucasfilm. The question is, will the movie ever actually get made? The studio has announced plans for a third Star Wars spinoff movie in 2020, so it is possible that could be where the Obi-Wan Kenobi movie lands, but we'll just have to wait and see.